On my trip around the north of the county I was staying in a few b’n’b’s, which I very much enjoyed. It was great to meet people, have some interesting conversations and learn something about each place I was staying in. 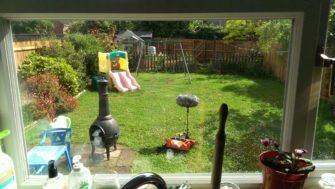 In Great Yeldham I stayed at Robin’s house, and in the morning she kindly let me record the sounds in her back garden, which included the neighbours’ rather unconventional gardening sounds.